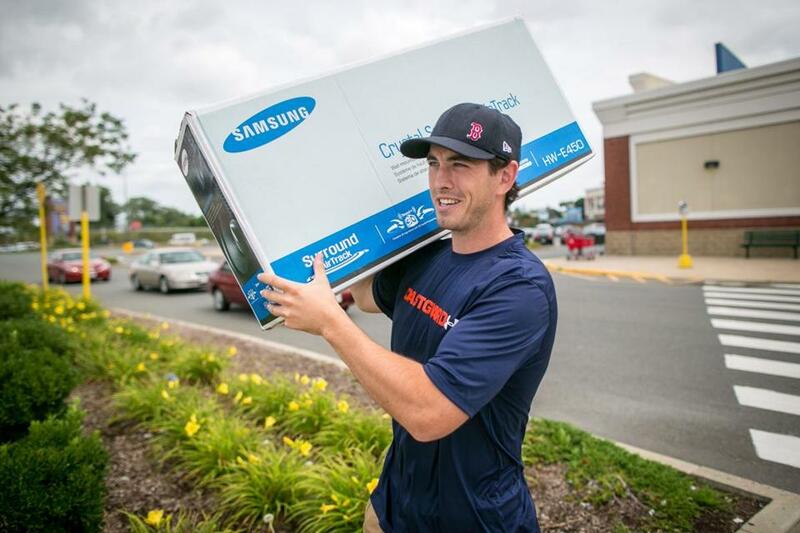 A shopper carried a speaker he bought during the Massachusetts sales tax holiday weekend in 2012. The Massachusetts House of Representatives was poised to pass a bill Tuesday that would set a sales tax holiday for the weekend of Aug. 11-12, giving consumers a chance to purchase goods of $2,500 and under without paying the state’s 6.25 percent sales tax. So if you’ve got your eyes on a couch or washing machine, it might pay to wait. But “might” remains the operative word — for now. While the broader bill the House is considering is a sure bet for passage in the chamber and Governor Charlie Baker supports such a holiday, it’s unclear where the state Senate stands. Still, the prospect of a holiday has renewed a familiar debate on Beacon Hill — about whether such events actually boost sales or just shift them, and whether it’s worth the state forgoing $25 million or more in lost tax revenue. But Representative Jay R. Kaufman, a Lexington Democrat, said most economists agree it doesn’t actually help the economy. The argument from Roy — who sponsored an amendment putting the sales tax holiday in a broader bill focused on economic development — won out. The amendment was approved on a 127-18 vote. Among some in the Senate, there was a sense of inevitability about the holiday. Jon B. Hurst, president of the Retailers Association of Massachusetts, said he was reassured by legislative leaders that a separate bill would put a sales tax holiday in place for 2018. In past years, the two-day reprieve from the 6.25 percent sales tax has taken place in mid-August. Legislators have waited until the last minute to pass a sales tax holiday before, but that can create logistical problems for merchants who need to plan for staffing, inventory, and advertising. Jared Walczak, a senior policy analyst at the Washington-based Tax Foundation, said sales tax holidays aren’t typically an effective way to stimulate a state’s economy. Essentially, he said, most consumers are buying things they would have bought anyway. Senator James B. Eldridge said he considers the sales tax holiday to primarily benefit the big-box stores, in part because they have more resources to run ads based on the event. He said he would rather see the sales tax money spent on more pressing issues such as education, transit, and public health. Last year, 16 states had some form of a sales tax holiday, Walczak said. They’ve been declining modestly since peaking in use during the mid-2000s, in part because of budgetary pressures and a broader awareness of their effectiveness, he said. “States are more likely now to be eliminating them than creating them,” Walczak said. Massachusetts had a one-day tax holiday in 2004, and full weekend holidays from 2005 through 2015 with one exception: Legislators paused the celebration in 2009 when the state faced a massive budget crunch. In the last two years, there have also been fiscal woes, so no sales tax holiday was put on the books in 2016 and 2017. There is some fine print to the proposed holiday again. As in previous years, the sales tax would still apply to motor vehicles, motorboats, and cigarettes — as well as all items that cost more than $2,500. New this year: no sales tax break for marijuana products. The move for the holiday comes amidst a flurry of law-making activity as the two-year state legislative session winds its way toward the last day of formal sessions: July 31. Joshua Miller can be reached at joshua.miller@globe.com. Jon Chesto can be reached at jon.chesto@globe.com.